DAVIE COUNTY, N.C. (WGHP) -- A dog picked up and thrown across the road in a tornado is now spending his first week at home. Lewis Vannoy says his dog, Duke, was thrown about 1,000 feet when a tornado came through Davie County almost three weeks ago. "Picked up in the mass of the swirling wind, picked up and tossed just like a ragdoll," Vannoy said. The 12-year-old Australian Shepard survived. 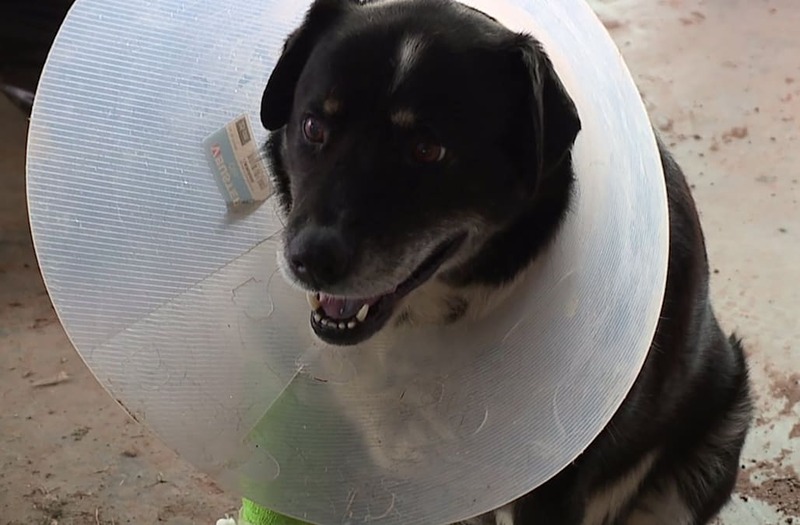 A 12-year-old Australian Shepherd survived a tornado that hit North Carolina a few weeks ago reportedly tossed him about 1,000 feet away from his home. "When I got to him, he was across the road in the pasture," Vannoy said. "He could hardly walk. He was in severe pain. He was lethargic and crying." Vannoy said Duke's right leg was broken in multiple places and his retina was damaged. The dog had multiple surgeries and spent some time at the vet. "He's going to have a full recovery," said Vannoy. "Thirty-five years to build it, 35 seconds to destroy it," Vannoy said. "Home, barns, garage, tractors, lawn mowers, there's nothing here that doesn't have damage on it." "I'll build another house and we will make more memories," Vannoy said. "I ain't giving up," Vannoy said. "It makes you hold on to your children and your grandchildren a little longer," Vannoy said. He's also happy to have Duke with him. "You really become attached," Vannoy said.